Photographer Bernhard Lang took these amazing aerial photos while strapped underneath ultralight planes. Somehow his images manage to capture beauty in the most unlikely of places—whether he is taking pictures of container ports, car parks or even open pit coal mines. 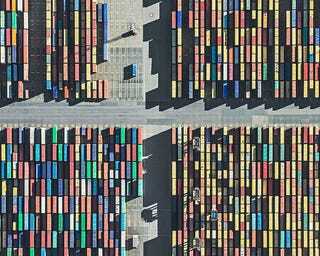 Bernhard's images from one of Germany's biggest ports (above) look like pixels lit up on a screen as do his photos of car parks (below). The following images are from the Tagebau Hambach mine in Germany. It is the largest opencast brown coal mining pit in the country and the biggest hole in Europe, occupying 85 square kilometers. It is 450 meters deep. For me the images of opencast brown coal mining with it's huge reclaimers "biting" into the soil, show quite directly the human impact on and exploitation of our environment. Some of these reclaimers are the biggest of the world: 240 meter long, 96 m high and have a weight of 13500 tons. From above the scenery with these huge "monsters" in this strange mining surrounding reminded me of another barren planet out of a science fiction movie. The textures created by these diggers made out of coal, gravel, soil, sand, water... was very visually interesting for me - looking sometimes like abstract paintings. Bernhard Lang is a Munich-based photographer. He is interested in the impact of industrialisation and human beings on the natural environment. You can visit Bernhard's website here, follow him on Facebook or find him on LinkedIn. You can also purchase his book or order prints here.